Pick Analysis: While only a bit over 5-foot-6 and 175 pounds, Cohen was one of the most productive running backs at the FCS level the past four seasons. The MEAC's all-time leading rusher (5,619 yards) and first three-time conference Offensive Player of the Year was an All-American in 2016, setting a school record with 1,588 yards and 19 touchdowns on 212 carries (37-339, one TD receiving). Cohen was a third-team All-American as a junior (264-1,543, 15 TD rushing; 25-217 receiving) and led the MEAC in scoring as well as rushing in 2014 (197-1,340, 15 TD rushing; 25-237, one TD receiving). Though he started only six games as a freshman, Cohen managed to run for 1,148 yards and eight scores on 195 attempts (11-152, one TD receiving). Published: April 29, 2017 at 01:12 p.m. 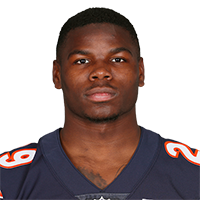 The Chicago Bears select North Carolina A&T running back Tarik Cohen in Round 4 with the No. 119 overall pick in the 2017 NFL Draft. Published: March 29, 2017 at 07:17 p.m.
North Carolina A&T running back Tarik Cohen goes through drills at the 2017 NFL Scouting Combine. Published: April 21, 2017 at 06:37 p.m. The "Path To The Draft" crew compares North Carolina A&T running back Tarik Cohen to Eagles running back Darren Sproles.